Re: your AWESC questions - I'll clear that up once in this thread. Legacy Calibration allows you to use "full forward throttle" at power on to enter calibration mode. I've had issues with a couple of customers reporting issues with unexpectedly entering calibration mode mid-battle. As I've since provided alternative ways to get into calibration, this is now a legacy feature (although still supported). As a general rule, you probably don't want it, unless you have very specific use cases (like the ESC being completely unreachable after you've built whatever uses it). Calibration - The ESC needs to know where your endpoints are as all transmitters are different. Is it possible to see a picture of the arena we’ll be using at the event? I don't have an immediate picture to hand - but it will be the same one we used last year, albeit with a few changes. I will see if I can dig some photos out in the next day or two. Notably the floor will be a single sheet of hardboard, fractionally smaller than last year, instead of the two sheets we had last year, thus avoing any joins in the floor. How many drop offs will it have as I’ve nevet see. Your arena before so I’m just curious. The arena has 2 drop off edges. Sorry for short reply. On mobile. It’s okay man just wondering because I don’t want to bounce myself out the arena with the spinner. The arena has partial drop-offs on two sides, but not corners. Some parts have higher walls than others. This is a very good design in my opinion, it allows pushing out of the arena but does not make it too easy; it allows powerful flippers /spinners to throw robots over the fence but not without a big hit. 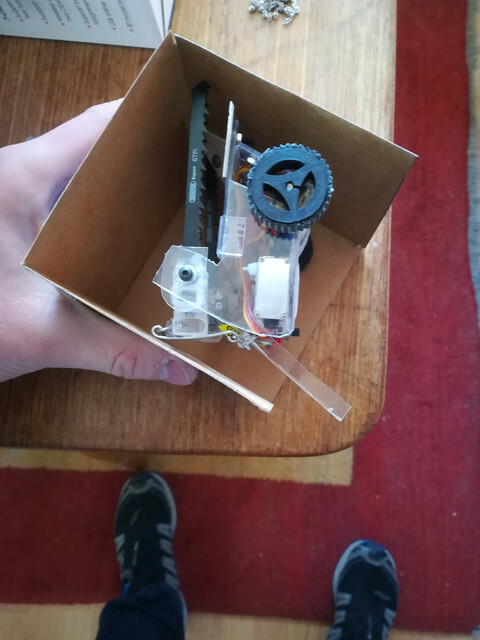 A query on fitting in the box - can I bend flexible outriggers to fit in? Because Jiggy fits if he goes in sideways and the tail bends upwards as he slides into the box. Otherwise the tail sticks out a fair bit. You can have parts of the robot unfold in the arena but it has to be done by remote control. 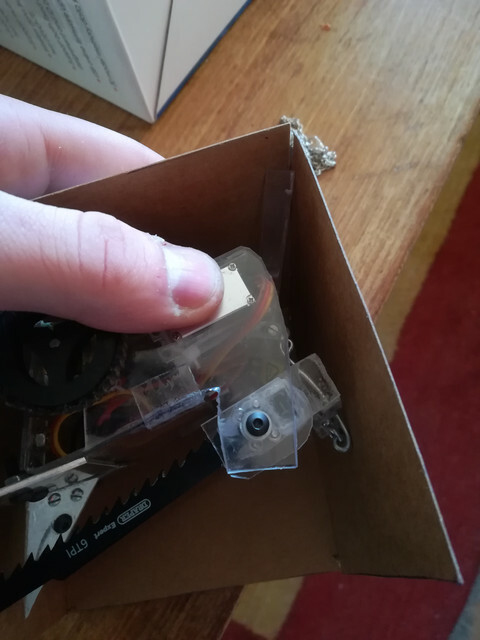 You can't just bend bits in that are held there by the cube, the robot must enter the arena in the state but not necessarily orientation that the fit in the cube. May be time to start designing a version 2. Or I look into restraining methods that will hold the tail bent until I begin driving. Does it matter if a bit of the robot is literally designed to fall off the moment the wheels start turning? Last edited by LimaHotel on Thu Apr 11, 2019 12:18 am, edited 1 time in total. Does it matter if a bit of the robot is literally designed to fall off the moment the wheels start turning? I'm pretty confident this would be fine, but I'm not 100% certain. Sounds like one of those "check with the EO first" things. One thing you could try is have the robot start sitting on the tail & use the movement of the drive/weapons to somehow make it roll onto the wheels. My flipper Please Shut Up starts sitting on it's acetate & that has been OK so far.